The GNU Free Documentation License (GNU FDL or simply GFDL) is a copyleft license for open content such as software. It was made up by the Free Software Foundation (FSF) for the GNU project. It was initially created for use with software documentation, but can be applied to other types of works as well, such as Wikipedia. As a copyright license, the GFDL is a type of contract between the creator of a copyrightable work (such as a book, an encyclopedia article, a painting, or a piece of music) and anyone else who might want to use it. The GFDL is considered "copyleft" because the license is meant to make it easier to use and re-use the copyrighted work, not to restrict its use. The GFDL also says that in order to distribute or modify a work licensed with the GFDL, the re-user must give credit to any previous authors of the work, and include a list of changes they made to the work. Finally, any work licensed with the GFDL must contain, somewhere, the entire text of the license. This provision has been criticized, because it is not always easy to include an entire, long license with a copyrighted work. In a book, for example, it is easy to include one extra page with the license, but if the work is something like a song, or a photograph, it is not easy. The GFDL has other requirements that are more complicated. For example, if part of the work is labeled as an "invariant section," it cannot ever be removed or changed by someone using the work ("invariant" means "does not change"). Works licensed under the GFDL may be included in with non-GFDL-licensed works only if it is clear which parts of the work are licensed as the GFDL. For example, in a book of poetry it would be easy to label some poems as licensed under the GFDL and some not licensed under it. But it would not be easy to label if part of a song was licensed as GFDL and the rest was not, so this would not be allowed. Any use of GFDL material which violates the terms of the GFDL is potentially copyright infringement. A number of online projects use the GFDL. An online project to license its content under the GFDL is Wikipedia. The GFDL has been criticized by many people who wish that it made it even easier for content to be re-used. Among the criticisms are that it is very hard to combine GFDL material with other copyleft licenses, that it is not always clear and easy to understand, and that some of its requirements, such as the "invariant sections", are not free at all. All previous authors of the work must be credited. ↑ Richard Stallman (12 September 1999). "New Documentation License--Comments Requested". 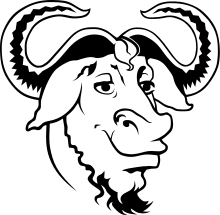 gnu.misc.discuss. (Web link).